The prison has been a sticking point between U.S. and Afghan authorities, and tensions over the facility re-emerged last week with sharp words from Karzai that the commander of NATO's International Security Assistance Force called "inflammatory." A Pentagon spokesman said that Hagel and Karzai had spoken on the phone, but he did not specify whether a deadline had been set. "Secretary Hagel spoke with Afghan President Karzai this morning to discuss issues of shared concern, including detentions," George LIttle said in a statement Saturday. "They agreed to use the next week to conduct intensive work with a view to concluding an agreement that fully recognizes Afghan sovereignty and our mutual interests in security of the Afghan people and our respective forces." Tensions between the NATO-led coalition forces - especially those from the United States - and Karzai have escalated since a bomb blast in Kabul earlier this month that killed nine people. Karzai said afterward that there are "ongoing daily talks between Taliban, American and foreigners in Europe and in the Gulf states." The comment effectively claimed the United States was trying to foment continued violence inside Afghanistan, and it was quickly denounced by NATO and U.S. officials. In an e-mail sent Wednesday to his top commanders, Gen. Joseph Dunford, the commander of ISAF, warned of new risks of attacks due to rising tensions between NATO forces and the Afghan president, an ISAF official told CNN. Karzai's recent statements "could be a catalyst for some to lash out against our forces - he may also issue orders that put our forces at risk," Dunford said. Some experts say Karzai's comments have been fueled by frustration over the detention facility not being handed over, which he views as an attack on his country's sovereignty. Kimberly Kagan, who leads the Institute for the Study of War in Washington, said the Bagram facility has symbolic importance for Karzai. "President Karzai wants full control over the detention facility at Bagram because it is a symbol of his sovereignty and his ability to realize his own legal system," she said. Last March, U.S. and Afghan authorities agreed on a plan to hand over the prison and detainees from the Parwan prison at Bagram Air Base within six months. But in September, the United States "paused" the transfer of detainees. 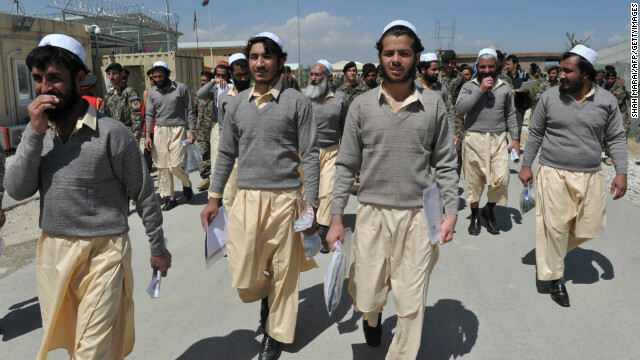 Karzai has been adamant that all prisoners be under Afghan control. Last year he called the U.S. failure to hand over all detainees at the facility a "serious breach" in the deal outlining the transfer of power from U.S. forces to Afghanistan. The U.S. military has not publicly discussed the specifics of the dispute. But a military official, speaking on the condition of anonymity, told CNN last year that the United States was holding on to several detainees over concerns about whether Afghan authorities will properly handle their cases and under what circumstances they might be released. -CNN's Azadeh Ansari, Barbara Starr, Mike Mount, Jake Tapper and Chelsea J. Carter contributed to this report. No thanks Karzai, we have no use of those skunks; just starve them to death. Sorry folks, I didn't post that stupid comment above. My question here is will these political prisoners continue to be tortured under Karzai's control as is currently being done under the control of the NATO thugs. Hopefully not, but one never knows. Sorry folks, I never posted that idiotic comment above. My question here is will these political prisoners continue to be tortured under Karzai's control as it is currently done under NATO control? One never knows!